You are here: Home / Health / Detox / Cucumber-Melon Spa Water Recipe! Rejuvenate and refresh without stepping foot inside a spa. 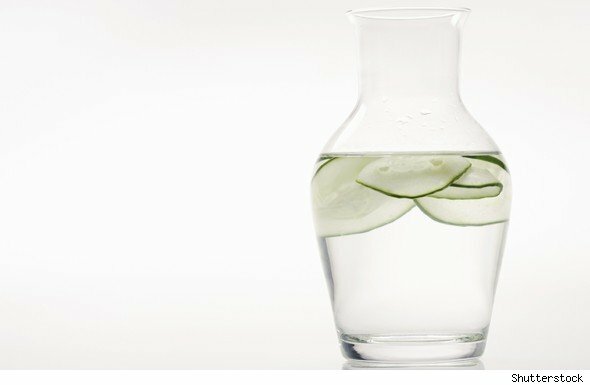 This recipe for Cucumber Melon Spa Water from chef and author Candice Kumai is a hydrating treat. ** Add in fresh basil, or even lavender, orange slices or even some simple syrup for an even sweeter treat! 2. Fill pitcher with water. Cover and chill for a few hours before guests arrive. 3. You have the option to strain the mixture and discard solids, or use the infused spa water as a visual treat, and have a strainer on the spout/lid. Pour water into gorgeous, tall, clear glasses, with big ice cubes for a real refreshing treat, add more mint and even a few thin slices of cucumber on the brim of the glass for garnish. Fancy! « 25 Tips To Stop Health and Beauty-Destroying Habits!